How much thread engagement does it take to hold Cateks on securely? I'm only getting about two turns, maybe three. I get one turn initially, and then tighten criss-cross to get another turn and a half or so. Is this enough? Am I overlooking something? I used a longer screw when I replaced the hex bolt interface, also Catek has an optional fixed heel bale that you might be interested in try their website. Finally I used a duct tape wrap around the heel bales to prevent boot slippage due to torque, worked for me. Has anyone tried the fixed bail with Raichle snowboard boots? I thought it was for ski boots... but if it fits well with snowboard boots, it's something I should look into. Are you talking about the main center screw that holds the whole thing together, or the mounting screw that hold it to the board? If its the mounting harware, you might need to by longer screws. 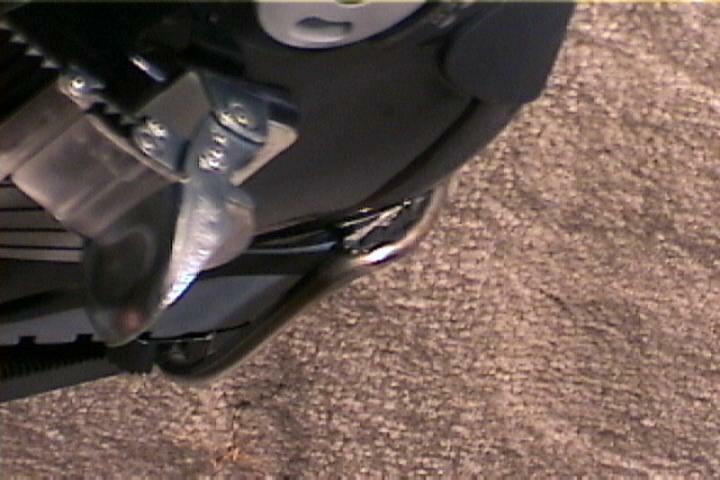 If its the center bolt, make sure that none of the corner posts are engaging the mounting disk, then tighten the center bolt all the way down. From here you set the corner screws to provide some positive pressure and tilt the plate as desired. The bindings came with 16mm screws, the next size up at the hardware store was 20mm, and those bottom out too soon. I know I've read about the scarcity of 6x18 screws here, but I didn't pay attention... before I get busy with the Dremel tool, does anyone have a favorite source for 6x18mm flat-head socketed metric screws? http://www.nutty.com/ has 6x18 flat head socket screws, I should see a bunch of them in my mailbox next week. I just realized I forgot to call Catek first. Oh well. I don't know what size I have, but I sent Jeff an email when I got my Coiler (very deep inserts) and he droped 8 screws in the mail for me. Subject: Center bolt first ?! Wouldn't it be easier to adjust the canting by first adjusting the corner screws for the desired canting, and then mount it onto the disk and tighten the center bolt ? That's what I do. you MUST ensure the centre bolt is tightened first, without any pressure on the 4 adjusting screws. Check the instruction sheet that comes with the Cateks. 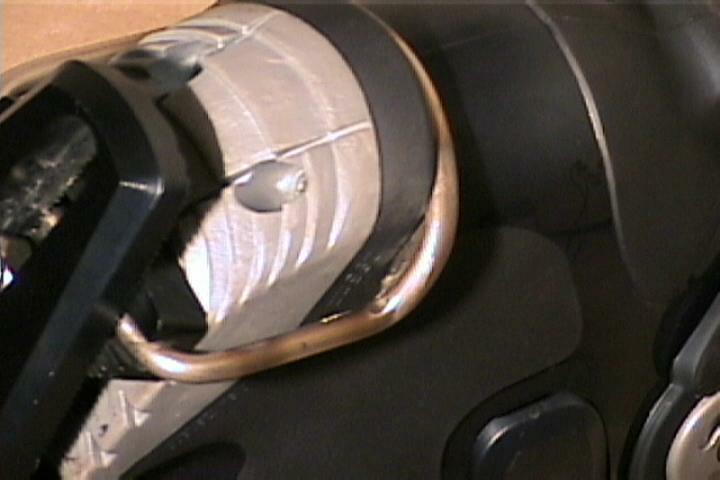 The higher the lift angle, the more washers you put under the centre bolt (to allow for clearance between the boot plate, and disk). I bought Cateks because I heard the heel bail would be a better fit for Raichle boots, but looking at Cateks and Bombers side by side I think that Bombers actually do fit better. On the sides of the heel ledge, both bails diverge from the contour of the boot, but the Cateks more so than the Bombers. The critical point is right at the corners of the heel ledge... this is where lateral forces get transmitted to the binding. If the binding would match the contour of the boot, the interface would be solid... but since the bail diverges from the boot, the heel ledge can actually deform a bit, bending downward and wedging the bail off of the back of the ledge. I'm pretty sure this is what happens when bindings release unexpectedly. So I used trial-and-error to cut the shape of the boot's heel ledge out of a piece of cardboard (cereal box actually). Then I traced the heel bail, then traced the cardboard over that, and shaded the area that needed to be filled in to get the bail to match the contour of the boot. Then I looked up "welding" in the yellow pages. :-) With a little luck, by the end of the day Friday I will have Catek heel bails with extra metal welded on to match the boot contour. 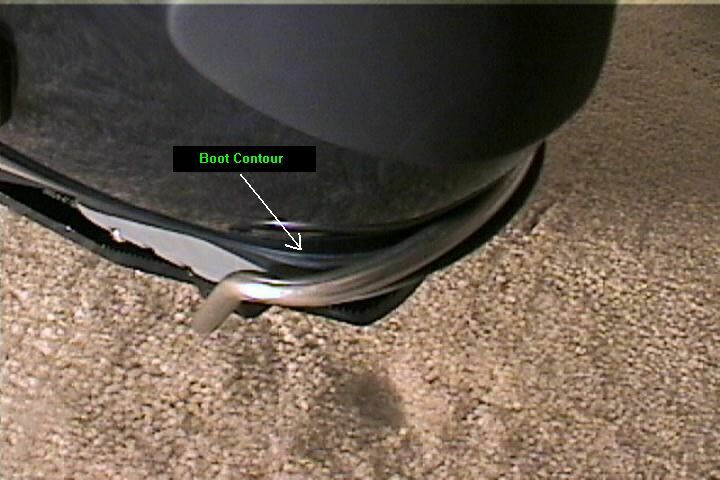 The first picture shows the divergence of the Catek bail from the boot contour. There's room for improvement, don't you think? The second picture shows the interface upon which life and limb depends. I don't know if it's clear from the photo, but try to imagine the boot being leaned sideways, hard. The edge of the ledge bends downward... and now the downward angle of the ledge meets up the cylindrical curvature of the bail in a way that basically helps to pry the boot out from under the bail. I didn't actually force my boot completely out of the Cateks, in testing today, but I have no doubt that I could have if I had tried just a little harder. I only stopped because I was worried that the heel ledge was going to be permanently deformed before I even got a chance to ride these boots. 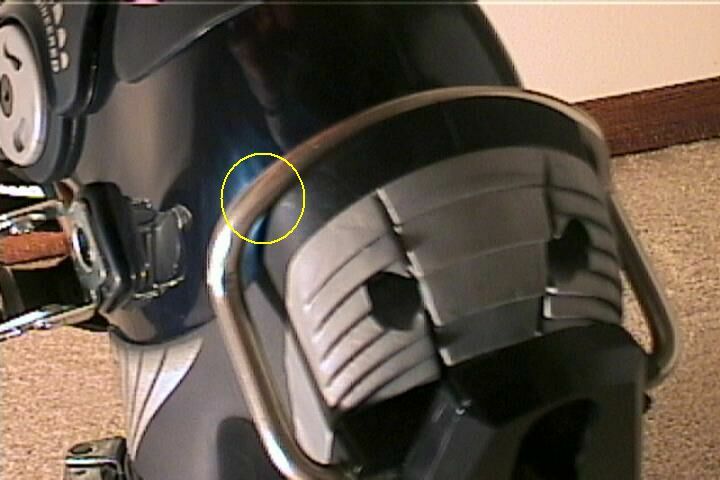 Nate, I seem to have the same interface with my boots (burton furnace) I wonder which boot Jeff used as the mold? ?Oh and at least 3.5 full turns! That sounds like a good idea, I think you are right in thinking that the gap between the boot ledge and bail could allow the boot to rotate out of the binding. A couple things. After welding the metal of the bail will be annealed, and therefore sliightly softer. Because of this the bail may be quicker to loose its shape after bumps and repeated impacts. I would make sure to keep an eye on the bail to make sure it doesn't bend away from the boot over time. Also, stainless can begin to rust where it has been welded, but that shouldn't be too big a deal. Do you think the softness due to annealing could be addressed by quenching the bail right after its welded? It's probably not too late for that, I don't think they have started work yet. They aren't ready yet, in fact I'm not sure the work has even begun, but I'll post more pictures when I get the bindings back. I wonder if they'd let me take pictures as they go? I can ask, if there's interest. Some of the effects of heat depend on what steel Jeff uses on the bails, and what sort of heat treat (assuming any) he uses. If they are heat treaded, then the heat from a spot weld will be pretty inconsiquential over the whole bail. The part were the circuit is made will soften some, but thats about it. Welding now is usually electric, so while it gets real hot, thats all very localized and won't extend out onto the bail much if the welder is worth his or her beans. Even if the bail feels hot to the touch all over, it is likely not up to temper heat from the tacks needed to do the job you described. A quick quench would temper those spots, but tempering not only makes things hard, it makes them brittle. To take out the brittle, you have to draw the steal at a steady, longterm temp. Its easier to have a softer bail that will possibly defor ever so slightly then one that is too brittle,at least in my mind. Mind you, all of this is really just talk, as those little peices you are having put in will really not generate enough heat long enough to cause much of an issue. I prolly shouldn't respond after I've started drinking, but as this site has a tradidtion of drunken responses I'll go for it anyway. Since I don't know what material Catek bail are actually made of, I CAN'T MAKE ANY DEFINATE STATEMENTS!! I can only reltate generalities. To get technical: there are two main ways of strengthening a piece of metal, the first is heat treating. This isn't really crittical, because the types of stainless that would be appropriate for a high performance application arn't overly sensitive to thermal history (the rate at which the material was cooled). You will loose some stiffnes by welding the bails, but it is difficult to quantify what will actually happen. my email adress is rocketscince because I allways tell people that stuff is not rocket-science. The stiffness that will be lost will only be in the area of the weld, and shouldn't extend far beyond the areal that is welded. I would guess that any strength you loose would be made up by the material you add. The annealing will be localised in the weld area, and it is not really critical to get pictures of the process. If I were you I would do it, I think the boot rotating and wedging itself out of the binding is a way bigger problem than strength that may be lost by welding stuff to your bails. I would say to make sure the guys know they are welding stainless.. I would also say that since you are trying somthing new you check after every run to make sure everythig is ok. Thanks for your thoughts though. It may not be definitive, but at least it's encouraging. Tell us how the modified bails work out for you. I just realized I never reported back. They have worked pretty well, but I have had one release (in about 15 days of riding), so I am still not quite satisfied. It was definitely the heel bail that let go - the toe lever was still in place, til I wiggled my foot some and came out completely out of the binding (fortunately at that point I was already sitting down). I'm tempted to tighten up the toe and heel blocks, but then it takes an awful lot of force to close the lever, and the boot sole flexes more, so I'm not real keen on that idea. I just finished moving my Cateks from my main board to my backup board. Cost me fifty-two bucks, plus a half-hour of fine-tuning with a Dremel tool when I got them back from the welders. Gonna try them out for real this weekend.